I made this dish a year ago after seeing Romano green beans at the farmers market and fully intended to post this recipe then. But time got away from me it seems. Just last weekend, we were in Vermont to visit Randy’s brother and his professional gardener partner, Bill, for their wedding. It was non-stop eating and cooking out of the garden. Bill had an abundance of runner beans he wanted to find a use for and, shazam, it just so happens that I had a recipe. Plus, he had almost all of the ingredients right outside. This is a delicious vegetarian “stew” that can be served as a side dish or as a main, as we did on the last night of our visit. It was a treat to have this lighter supper after feasting for three days although, speaking for myself, I sorta stuffed myself on this meal as well. 🙂 I’m sorry I didn’t get a photo of this year’s version. In looking around at the various recipes, I learned that “ladera” means braised in olive oil, hence a larger quantity of oil than you might expect in a recipe like this. With all those recipes in mind and some advice from a Greek friend, I decided to make this dish as follows. It is HIGHLY adaptable, however, so have at it! Once finished, serve with slices of feta cheese and a nice crusty bread. A dry rose on the darker, richer side goes really well. I’ve been wanting to make this since my friend Beth from Tasty Yummies told me about it a few years ago. She even wrote a blog post about it after we talked about it, and I just completely forgot to make it! I’m kicking myself now for forgetting, and I’m very happy that Aunt Suzy brought it up again, because I TOTALLY love it. This is like comfort food, for summer. I will be making this often, I think. Beth’s recipe has beef or lamb in it, and I think that would be a nice way to try it when the weather gets cooler. Speaking of the weather, it worked out perfectly that I planned to make this when I did, because it got unseasonably cool here in Chicago, perfect weather for eating stew. I actually had to wear a lightweight sweater today! In August! So weird. Warm the olive oil in a large dutch oven over medium heat. When shimmering turn heat up to medium high and add the onions. Sauté for 5 or so minutes, till translucent, stirring frequently. Add the garlic, stir and continue cooking for 1-2 minutes. Add most of the parsley and mint and all of the oregano. Stir to combine and cook for 1-2 minutes. Add the beans, the carrots, the tomatoes and allspice berries, if using, and stir to thoroughly combine. Add the water and press all ingredients down into the juices so they are just covered. Cover the pot, bring to a bubble, reduce heat and simmer for 20-30 minutes. Add the potatoes and press all ingredients down into the juices again. Bring back to a bubble, reduce heat and simmer 30-45 minutes until the potatoes are cooked through. While the potatoes are cooking combine a few tablespoons of parsley, 2 tablespoons of mint and the minced garlic. 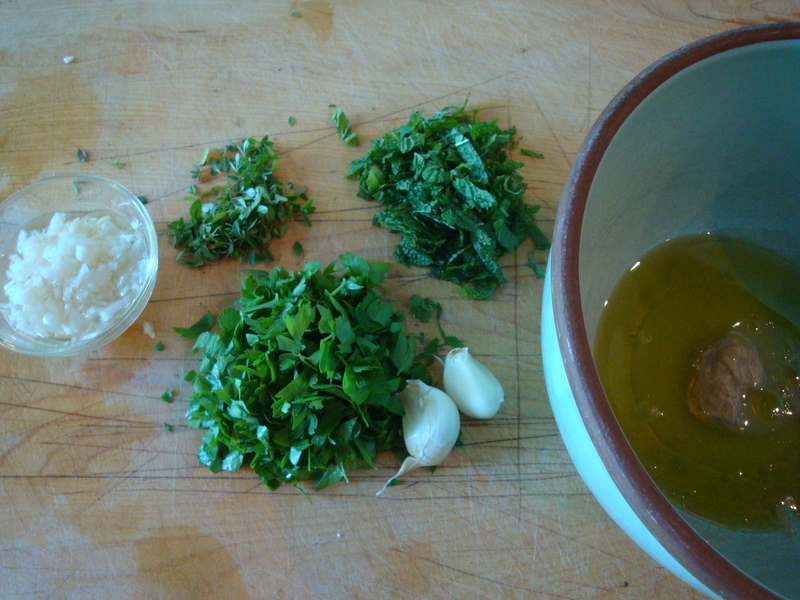 When the dish is finished, stir this herb/garlic mixture into the pot. Turn into a serving bowl or just serve right out of the pot! Aunt Suzy: The quantities of ingredients are what I would call guidelines. I’ve seen many recipes that use dill in addition to other herbs and many that use solely parsley. The oregano is my addition. I saw a couple of recipes that said “DO NOT forget to add 1 teaspoon cinnamon at the end”. I asked a Greek friend for advice, and he suggested the carrots and said he adds zucchini when he adds the potatoes (but had not heard of the cinnamon :-)). If you cannot find the flat, longer type of beans called for here, you can use “regular” green beans. I see runner beans occasionally here in the farmers markets, but have not seen in supermarkets in Minnesota. There are versions of this dish that include meat – beef, veal or lamb – but I really like this as a vegetarian meal. Margaux: I added about a teaspoon of salt when I added the potatoes, because I really don’t like potatoes cooked without salt. Then I added pepper at the end with the herb/garlic mixture. Also, I used regular beans and it turned out great! I saw this recipe in a recent Bon Appetit and thought it fit right in to our Pasta Wednesday theme – easy, throw together quickly, healthy and delicious – even if it is hard to say! It reminded me of another no-cook pasta sauce we posted a couple of years ago that had a variety of nuts but basically the same approach. 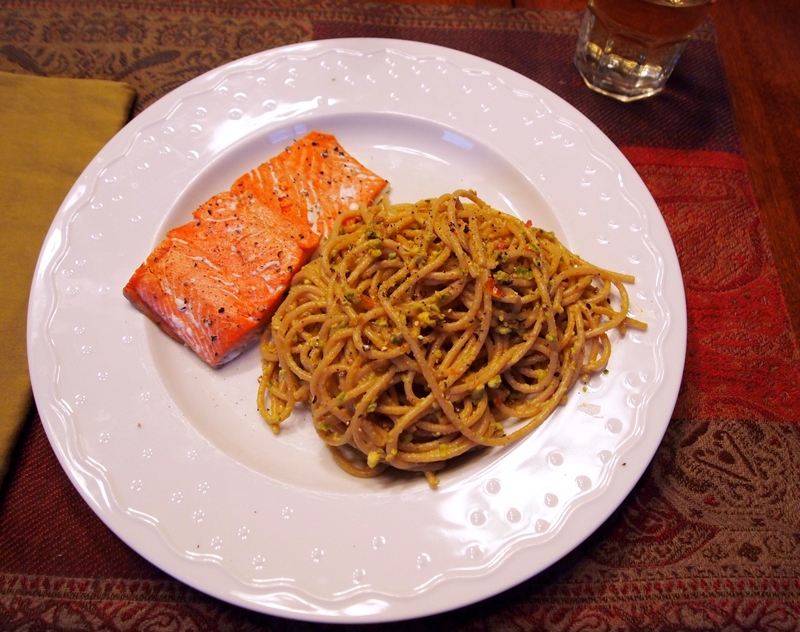 This recipe is a little less fancy, qualifying it for a perfect weeknight meal. I love cooking with mint and nuts which are ubiquitous ingredients in Sicilian cooking. (I must take a trip there one day.) The quantities listed made a lot of pesto so I had a chance to experiment with different pastas. I had it as a main dish on bow-tie pasta served with a salad. I served, as you see in the photo, as a side dish to salmon. While I liked it both ways, it’s very rich so I thought is was better as a side dish. An Italian white wine is a perfect match, even better if you can find one from Sicily where they are a little on the richer side. Pulse the first 6 ingredients in a food processor until coarsely pureed. Turn into a bowl and add the olive oil. Stir until creamy, a bit like chunky peanut butter. Cook the pasta to al dente according to package directions. Before draining the pasta, reserve 1/2 cup pasta cooking water. Drain and rinse the pasta. Return to the pot and add 1/2 cup of the pesto per 1/2 pound pasta. Add a little of the pasta water and stir to blend thoroughly. Add enough of the pasta water to make a creamy sauce. Keep on the heat to heat through before serving. NOTE: The pesto can be refrigerated and used at a later date or used as a sandwich spread. Today demanded soup, but I’m in the mood for spring now that it’s March. 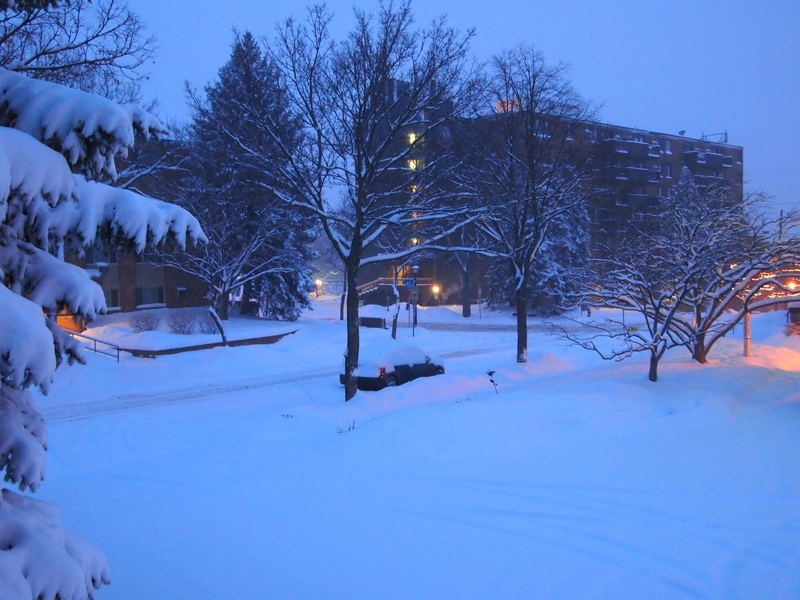 I would not say spring is around the corner here in Minnesota as you can see by this predawn photo, but enough winter already! 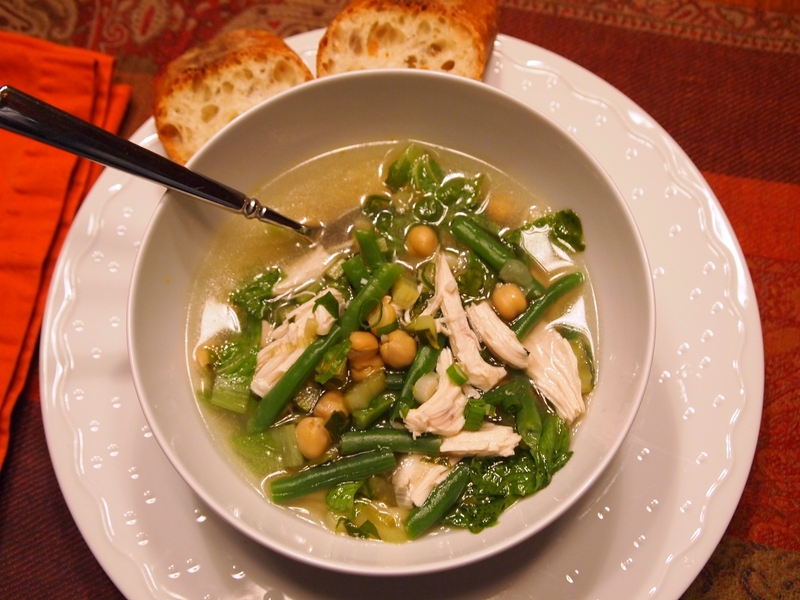 So here’s a soup that’s, well . . .a soup, but with many ingredients that taste of spring. Perfect for a day like today! Both Randy and I thought we almost couldn’t get enough. He wanted me to make sure to say that, in his opinion, this must be made with homemade stock, feeling that boxed or canned would diminish the light spring-like quality we loved so much. He also had an initial bad reaction to the idea of lettuce in a soup, saying that it’s like putting walnuts on a salad. After a few spoonfuls of the soup, he said that he must like walnuts on salad – hehe. So don’t be put off by the cooked romaine lettuce – it adds a light crunch and lovely vegetal flavor. Enjoy with a lemony Pinot Grigio and a baguette! Heat oil over medium heat in a large soup pot or Dutch oven. When shimmering, add the white part of the scallions and the celery. Cook, stirring, for 3-4 minutes until softened. Add the garlic zucchini, salt and pepper and cook for an additional 2-3 minutes, stirring. Add the chicken stock and chickpeas and simmer for about 10 minutes to blend flavors. Meanwhile, cook pasta al dente according to package directions. Drain and set aside. Add the chicken, green beans, herbs and lemon zest to the soup pot and simmer till heated through, about 5 minutes. Be careful not to over-stir. Right before serving, stir in the lettuce and lemon juice. Cook until heated through, about 2-3 minutes. To serve, place a handful of cooked pasta into the bottom of a soup bowl. Ladle the soup into the bowl over the pasta. Garnish with a few slices of the green part of the scallions (and a few red pepper flakes if desired). 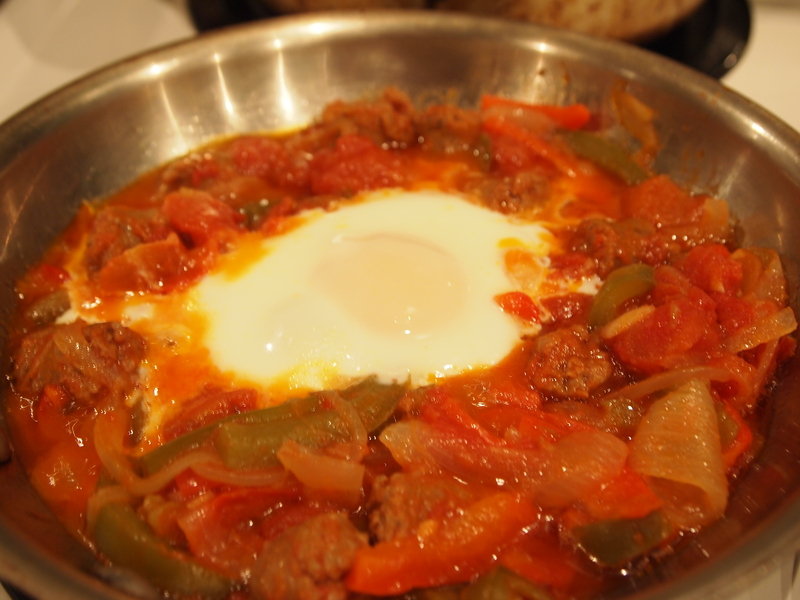 This dish (also called Shakshuka) is served throughout the Middle East and North Africa. There are many theories of where it originated, but it is common in Tunisia, Algeria, Morocco and Israel, where it is thought to have been introduced by Tunisian Jews. Wikipedia notes that it rivals hummus and falafel for the “national dish” of Israel. As you can imagine there are many variations on a theme with a dish like this. The common ingredients are peppers, onions, garlic, tomatoes and spices plus the eggs. Many recipes do not include the sausage and some, like this, emphasize tomato sauce over peppers. I’ve made it with and without the sausage, depending on my mood and ingredients on hand. 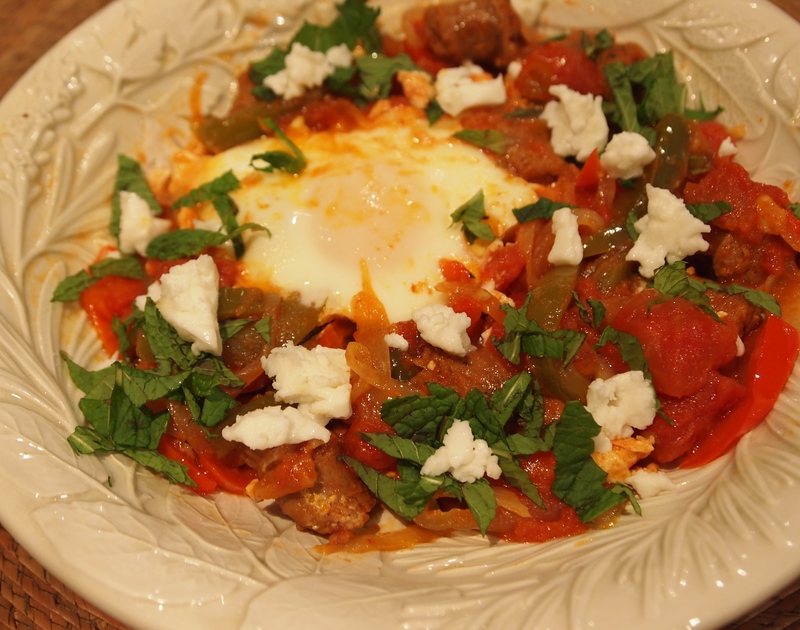 I make Chakchouka mostly for dinner, but I know it is often served for breakfast and would make for a great brunch. We made this for the first time last night…or should I say, Jason made it (so he should probably be writing this! ), and it was delicious! We made it without sausage, and threw in a couple of zucchinis instead. We both agreed that it would have been even better with sausage, but it was still good vegetarian. We also both wanted more eggs with it, so I think next time we’ll do 6 eggs instead of just 4. We love having eggs for dinner, and will definitely be making this again. And the harissa really added great flavor! Heat oil in large skillet. Add onions and bell peppers and cook, uncovered, over medium heat for 5 minutes. Add the garlic and cook another 5 minutes. Move the vegetable mixture to one side and add the sausages and cook for a few minutes. Add the Harissa and stir to blend. Add the tomatoes and season with salt and pepper. Cook all gently for another 10 minutes or so until everything is soft. Add the mint or parsley, or you can wait and sprinkle this on after placing on the plates. Use a large spatula to scoop out a portion of the vegetables with an egg. It should look like a nest on the plate. Sprinkle with the mint if you haven’t done this before and crumble the feta on top, if desired. Serve immediately with crusty french bread or toasted pita and a salad. Cook’s Notes (Aunt Suzy): If you do not have Harissa, but would like a little heat, you could use hot sauce or add a minced jalapeno or serrano pepper with the garlic. I would also add a little cumin if I did not use Harissa. I am lucky to live near Clancy’s Meats which makes its own Merguez lamb sausage. You can also order from Amazon by clicking on the link in the ingredient list. I think Andouille sausage or Spanish Chorizo might be tasty. Or as I mentioned in the intro, this is very delicious without sausage at all. I’ve been wanting to make a kohlrabi salad ever since seeing a recipe on a blog last year. I recently bought a beautiful kohlrabi – something I’ve never eaten nor cooked with – at the farmers’ market and came home to find this recipe in the Wall St Journal Saturday “Off Duty” section. It looked even better than the one that inspired me to buy the kohlrabi! 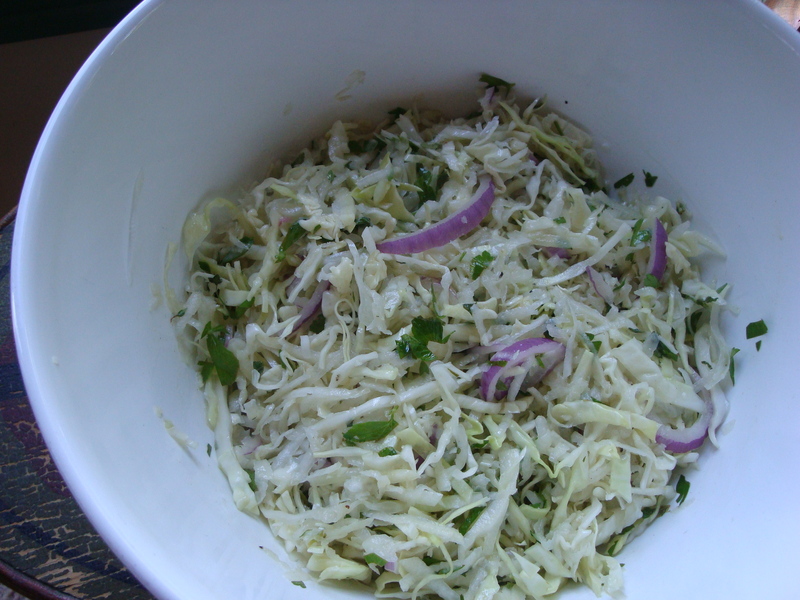 We really enjoyed the sweetness and juiciness the kohlrabi added to this slaw. It’s a perfect accompaniment to something grilled, shown above with grilled salmon and our spring farmers market potato salad. Note that for a salad like this, all quantities are subject to your taste! Quarter and core the cabbage, then cut in thin strips. Peel the kohlrabi and shred on the big holes of a box grater. Place both in a colander and add the salt. Place the colander over a bowl, cover with a towel and place in the fridge for at least 4 hours to expel excess moisture. Whisk the olive oil, mustard and lemon juice in a bowl until slightly emulsified. Add the remaining ingredients and stir to blend. 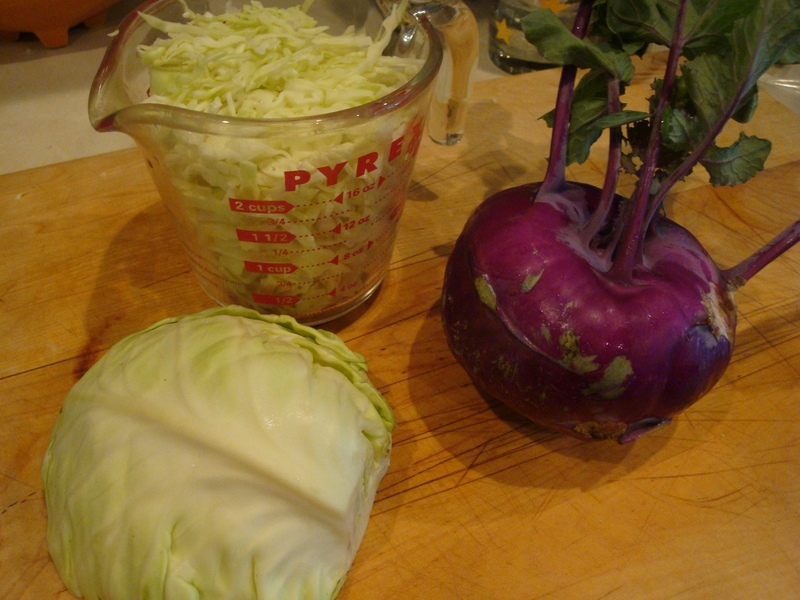 Squeeze any excess moisture from the cabbage-kohlrabi mixture. 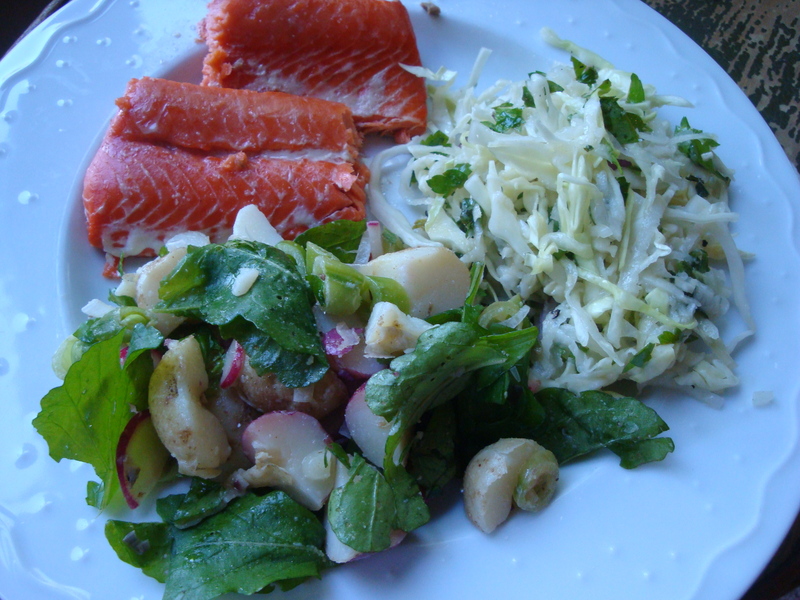 Place in a large salad bowl and toss with the red onion. Add the herb dressing and toss to thoroughly blend all ingredients. Taste and adjust seasoning, adding salt, black pepper or lemon juice as necessary. This recipe is a riff on Aunt Cindy’s Artichoke, Edamame and Asparagus salad. She had raved about that salad to me the week before I was having friends over for a cookout. It occurred to me that this would be a great basis for a pasta salad, and I just went crazy from there making adaptations. Like the A.E.A. salad this is based on, it was such a hit that it’s been made for more than one recent event. Thanks to niece Sarah for suggesting the cherry tomatoes. We served this with grilled chicken and Spring Farmer’s Mkt Potato Salad, which made for a great summer meal. Whisk all ingredients together in the bottom of a large salad bowl. Set aside at room temperature. Pre-heat the oven to 425° and place the top rack one down from the top of the oven. Pat the artichokes and asparagus dry. Line a cookie sheet or broiler pan bottom with foil and cover lightly in EV olive oil. Place the asparagus, artichokes and thinly sliced lemon on the foil and turn to coat all items with a little olive oil. Place the pan in the pre-heated oven and roast for 7-10 minutes until done. 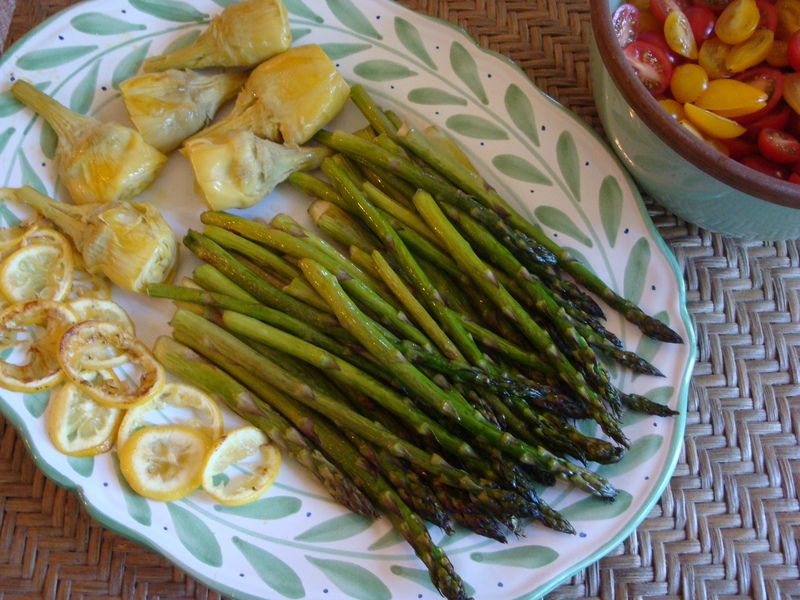 The asparagus does not need to be turned, but you will want to turn the artichokes and lemon slices a couple of times. I found that the artichoke hearts and lemon could go longer, so I removed the asparagus after 7 minutes and placed the pan back in the oven for about 5 minutes more. 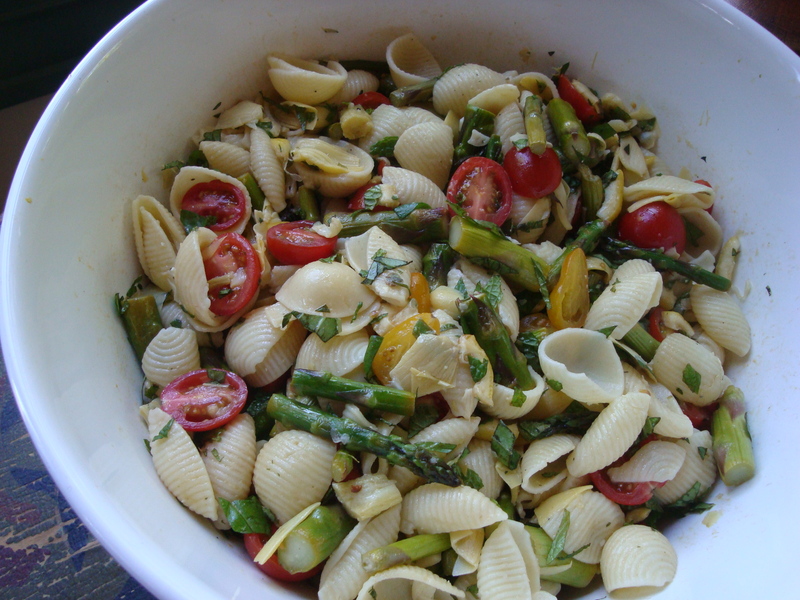 Cut the cooked asparagus into 2-inch lengths and the artichoke hearts into small pieces. Cut the roasted lemon into small dice. Add these ingredients to the dressing in the salad bowl. In the meantime, cook the pasta al dente according to package directions. Drain and let cool. NOTE: I did not like the shells and used spirals the next time I made this – much preferred! Add the cooled pasta to the bowl and toss to thoroughly blend and coat everything with the dressing. Add the cherry tomatoes to the salad and stir to blend. Lastly, add the mint and basil, stir to blend. Taste and add salt and pepper if needed. Let sit at room temperature to blend the flavors for at least 30 minutes.